If you can think it, our painter can do it. At Bob’s Paint and Body Shop in Broken Arrow, we understand that you want your vehicle to look professionally repaired. We use a waterborne paint that we consider the best, highest quality paint available. It dries faster, goes on smoother and the color matching is spot on. We take pride in making sure that your paint repair looks fantastic. BASF’s R-M Onyx HD paint system is certified by car manufacturers as superb at making your paint repair look brand new. Get the best paint and auto repair in Broken Arrow and Tulsa. Thank you for reaching out to us. Someone will contact you as soon as possible. Vehicle restorations and customizations are a passion. You absolutely love that 1969 Pontiac GTO, or 1931 Ford Model A. Or perhaps it is your new Corvette that you have dreamed about for years. Want your RV to represent your style? Or like us, you have a 1956 GMC Pickup that needs some tender loving care. You want to restore this vehicle to be either authentic or customize it to show your personal style. Whatever your dream is of the perfect look for your vehicle, we have the ability to make it reality. Auto restoration and customization has been a slowly dying industry. Most paint and auto repair shops strictly do collision repair and mechanical work. There are very few places in Broken Arrow and the Tulsa Area that do custom paint work We have a paint artist on staff with over 25 years of experience. 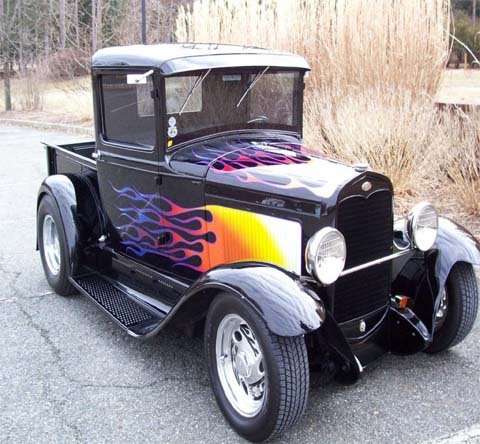 Whatever you can dream, we can paint it, from restoring old vehicles to customizing new. It is a fact that if you live in the Tulsa Area, eventually you are going to see hail damage. There isn’t much of a sadder vehicle than a hail beat up car. Door dings and minor dents happen all the time. If the paint isn’t broken, we can fix your car with a process known as Paintless Dent Repair. As its name implies, this is fixing dents without using paint. Essentially, our technicians go on the back side of the panel and massage the dents out using special tools just for this process. Because your car isn’t being painted this can be a much less costly alternative to repairing or replacing a panel. Be sure to ask us if Paintless Dent Repair might be a good option for your auto body repair.